LPNs in the army have different things to learn and cope with than LPNs from any other walk of life. Consequently there are a number of things that you will need to know about being an LPN in the army that you may not have yet been taught as an LPN in any other area of nursing. The job is highly intensive and you may even be required to enter combat situations as an army LPN. There are few areas of the world, however, that need trained medical professionals more than those areas where there is a war. Consequently, if you have what it takes to be an LPN in the army, you will always be in high demand as your skills will be sought after. To be an LPN in the army you need to be prepared to leave home for long periods of time, just as any soldier would have to do. This can put strain on relationships and other commitments, something that you must be aware of before taking on the job. Firstly you need to become an LPN. To do this you will have to complete LPN training at an accredited school. Schools are accredited by your state’s board of nursing, so their website is a good place to start your search. These courses are often offered by your local community college and consist of theory and practical work. Your training course will take about a year to complete. Complete the coursework and take the NCLEX-PN examination. The second step is not always necessary, but it is suggested that you become an RN before applying to join the army as this will increase your chances of being accepted for the job. To do this you will have to get a minimum of an associate’s degree in nursing. You will also have to take the RN examination which is known as the NCLEX-RN exam. After you have done all that it is time to apply with your local army recruiter and complete the tests, and so on, that are required in order to determine your suitability for the army. This will require many of the skills that you will also require in other nursing settings. In times of war field hospitals are set up in various places around the world in order to tend to injured and ill soldiers. With your nursing and 68WM6 (Health Care Specialist, LPN) MOS qualifications you will be able to work in any one of these settings at any place in the world. Army care can also be done domestically at army training facilities as training can also lead to injuries that may require the assistance of a trained nursing professional. The job is intensive and dangerous and will frequently take you far away from your home. How Is LPN Army Training Different From Regular LPN Training? “The first phase builds on the basic knowledge developed previously and lasts for eight weeks. The curriculum includes nutrition, fundamentals of nursing, microbiology, pharmacology, etc. Starting with the second phase, there is a lot of practical clinical training include in the program. Most of the work that you will study will be the same as what you would study in just about any LPN program for any nursing specialty anywhere. There will be a slightly stronger focus on emergency responses and a degree of combat training as well. You can expect to serve in a wide variety of medical settings, gaining experience that will serve you well later in your nursing career. There are many army hospitals around the globe and you could be stationed at any of them, allowing you to travel as well as to work in a field that you love and where you can make a noticeable and important difference in the lives of others. You may often have the opportunity to work in medical evacuation or other special fields that will make your skills even more advanced and sought after. Because of the previous points, 68WM6s who leave the service also have excellent job prospects in the civilian medical community as they have advanced skills that they have proven in practice in the field of battle. LPN salaries in the army can start at about $36,000 and increase from there, depending on a number of factors such as your level of education and where exactly you are stationed and what you are stationed there to do, , making it a fairly lucrative position to aim towards working in. What Is The Job Outlook And Salary For LPNs In The Army? 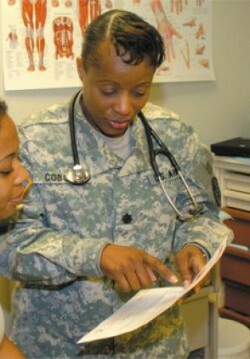 The job outlook for LPNs in the army is very good. Even if there is a time of peace (which we should all hope for), the army still needs to be maintained and soldiers need to have trained medical professionals on hand even when they are not on active duty. In addition the skills that you learn in army nurse training will equip you to perform better in practically every other nursing job in existence, which means that you will be in high demand across the board. Having this qualification more or less guarantees that you will always be able to find employment. Average salaries for LPNs working in the army are around $30000. There are, however, a number of subtle differences in pay depending on your level of education. If you are a licensed practical nurse (which you are) you can expect to earn in the region of $32,000 a year. Likewise a vocational nurse (another term for a practical nurse) can earn around $29,000 a year (this is mostly due to state differences as LVNs work in only one or two states while the term used in most other states is LPN). If you status is a health technician in the army you can earn $34,000 a year. There are many different areas in which you can specialize once you have an LPN qualification, and they are many and diverse. There is no obligation to continue with your LPN army training if you feel that you are not cut out for t. however, if you are cut out for it, go for it! There are many places in the world where your skills as an LPN in the army are sorely needed, and you will therefore be in high demand. In addition you will be able to get other LPN jobs fairly easily once you return from a war situation or once you decide to leave the LPN army sector. Having worked in an army setting you will be seen as a nurse that can handle pressure and work in very organized and controlled settings where procedures are followed rigidly. These are quite good skills to have in practically all areas of LPN nursing, so this will stand you in good stead when it comes to looking for another job. LPNs in the army are often a sector of the nursing industry that are overlooked and should be given more recognition for the stressful and highly necessary work that they choose to do across the globe.